If you have ever struggled with procrastination, then you have also struggled with a negative mindset. The two are intimately linked. We tend to go about our days with a cloud of negativity, even if it doesn’t feel like it. The negativity becomes normal, mundane, unnoticed. But if you want to break the cycle of procrastination, then you must break out of this state of mind and begin to think in the positive. So how is one supposed to do that? It’s definitely easier said than done. You have to make a conscious effort to change the way you see things and the way you react to the world around you. Though it might sound difficult, it is possible! I am living proof. I used to live in a world of negative thoughts, and I was the world’s worst procrastinator. But when I started making an effort to be more present, thankful, and positive, then procrastination began to loosen its grip on me. You can have all the tactics and tricks in the world to try to build good habits and make better use of your time – but unless you change your thought patterns, you’ll always come back to procrastination’s tight embrace. I know it can be tough to change something as deeply rooted as attitude, but it can be done – and I want to show you how! 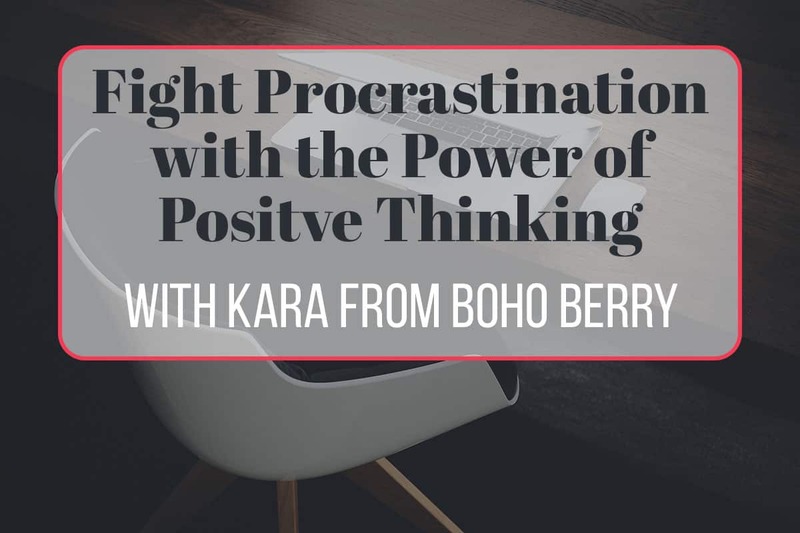 That’s why I am ecstatic to host a free live workshop on Thursday, August 17th at 11 am Central with none other than Kara from BohoBerry.com! Not only was Kara an inspiration for me when I started blogging, but she has served as a beacon of positivity and gratitude that I have always admired. She knows how to look on the bright side of life, and she definitely knows how to teach others how to do the same. I can’t wait to chat with Kara bout the best methods for making an attitude shift. I know it’s gonna be phenomenal, and I invite you to join! It’s totally free! You just want to be sure you register, because this workshop won’t be posted anywhere else. So if you’re ready to increase your positive thinking, ditch the negative, and break free from the cycle of procrastination, then I will see you on the 17th with bells on! I am just now learning about this webinar. Is there a way for me to still receive the link? ……and please don’t sell my email. My apologies for the delayed response, Arye! I’m afraid the webinar is gone, so there’s nothing I can do. Sorry about that! And don’t worry, your information is safe with me 😉 I never sell my reader’s data to anyone! Which will be the estimated duration of the webinar? I just want to make sure I block my calendar for the correct amount of time. Thanks! The webinar should last between and hour and an hour and fifteen minutes. Can’t wait to see you there! I may not be able to make the time frame but did register. Will I be able to view at a later time/date? Yep! If you register and are unable to attend at the live time, you will receive a link which will allow you to watch a replay for 48 hours after the event.